Ted's 'name-sake', Theodore Laing McKenzie was born and raised along the north shores of Scotland. He was a printer by trade and drummed in kilty bands. After immigrating to America, he settled in Philadelphia, Pennsylvania. Back then, Philadelphia was crowded with Irish immigrants due to the potato famine in Ireland. Most Irish people's last name began with a 'sir' name, 'Mc...', (meaning 'son of'). Theodore was clever to change his last name adding a simple 'a' in between capital 'M' and 'c' (most Scotts 'sir' name is 'Mac...'), converting the 'mck' to a 'mack'. He dropped his thick Scottish brogue and worked long, hard hours becoming successful in the printing trade. Theodore was a foreigner in a land filled with foreigners trying to survive the 'American way'. The youngest of their three children was Ted's dad, Malcolm Kenneth MacKenzie. At the age of four, Malcolm drummed as a mascot in his dad's kilty band. While marching in the streets of Philadelphia, Malcolm, would step up to the curb. The crowd would place coins on his drum to express their approval. Malcolm would later evolve as a jazz drummer. As a teenager he drummed in a band from Philadelphia called the 'Parissians'. Members of the band went on to perform with the Benny Goodman Orchestra. Bill Davies (piano) led his own jazz band for years to come. 'Mac", as his friends affectionately called him, married a young lady from 'Philly' named Dorothy Drucella Moore and dropped out of the jazz scene. Theodore Laing MacKenzie, the youngest of three boys, was born in 1948 in south Philadelphia. Four years later, they moved to Old Greenwich Connecticut. At the age of five, Ted was introduced to a pair of wire brushes and his father's old set of Leedy drums. Malcolm was careful to start Ted with the double stroke roll, paradidles and various rudiments. He immediately instilled in Ted a solid feel for swing. Jazz was Ted's interest, and Gene Krupa was his first drumming mentor. Ted's first drum set of his own was a set of black diamond Slingerlands given at Christmas--he was eleven. Ted's dad began bringing home Pete Fountain albums. Jack Sperling was Pete Fountain's drummer. He was one of the greatest big band drummers who, along with Louie Bellson, pioneered double bass drums. Sperling took over Ted's drumming fantasy--he couldn't get enough of Jack! Eventually Ted saved enough money to add on to his drums until there were two bass drums, various tom toms and cymbals just like Jack Sperling. Similar phases engulfed Ted's world, igniting and developing a very specific drumming style within him. When the Dave Brubeck quartet hit the charts, Joe Morello quickly became the one to follow. The late, great Buddy Rich was next. Like Ted, Krupa, Sperling and Morello all looked up to Buddy Rich. Eventually, Ted would study with Buddy's teacher and co-author, Henry Adler. It was the musical and art programs Ted excelled in at Greenwich High (class of '66). Ted's senior year marked the first drum student to take lessons on a regular basis. After High School, Ted enrolled at Winchester Academy as a post graduate student. He was elected president of the student council. After Winchester Academy, He enrolled at Berklee College of Music. It was there he began his serious persuit of drumming. 1967 was a great time for jazz. Ted arrived a month early to 'hang' & 'jam' with the upper classmen until classes started. Jam sessions would go for hours and would include students such as Richie Cole, Linn Biviano, the Labarbra brothers, Rick Petrone among other swinging young players, some of whom are high on the who's who list of jazz artistry today. The day of orientation, the late, great Jerry Mulligan stopped in at the request of a former baritone sax student who had run into him the day before on the streets of Boston. Ted never made it to class that first day at Berklee. As the year progressed, Ted played with more great players. One of his peers Clyde Brooks, invited him to check out what he was learning from Henry Adler in New York City. 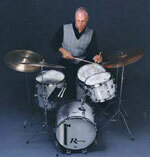 Mr. Adler is the collaborator and co-author of the famous 'Buddy Rich Book'. Eventually, Ted studied privately with Mr. Adler in Manhattan. At the end of 1969, Ted decided to begin what would turn into almost 10 years of 'on-the-road' performing. This gave him a rich smorgasbord of experiences including club dates, record dates, TV, rock 'n' roll bands, jazz bands as well as a few lessons with Jim Chapin (Jim wrote the book on coordinated independence). Some of the artists included: Root Boy Slim, The Blues Image, Billy and the Beaters, Jack McDuff. Like Ted's dad, marriage meant settling down. Ted followed in his dads foot-steps. Teds wife, Colleen, has been his anchor in all of his work. She has produced not only Teds business needs- but 4 beautiful children. Sean, the oldest boy, is the 4th generation drummer. Besides teaching drums, the main employment for the next decade came from the graphic arts field. After managing an art department for Connecticut's largest public relations firm, he became an art director for one of the largest non-for profit health organizations in America. In the mid 80's, Ted made a big change. The move to upstate New York took place in 1987. 'Freelancing' was to be the faith walk that would under-gird Ted's means for survival. The drum studio has evolved until today there are as many as 40 drum students a week enrolled in Ted's comprehensive program formulated from over 45 years of drumming experience.